These are a few shots taken at a bee eater colony location in Northern Bulgaria. These birds are renowned for their bright colors and are often photographed by bird photographers and enthusiasts. Photographing birds is not an easy task, to say the least. Patience is the thing of greatest importance here and I’ve found to lack that. Using a Canon 100-400 F4-5.6L, coupled with a 1.4 TC converter and a 1.6x crop factor DSLR available, gave me an effective length of 400×1.4×1.6 = 896mm ! Well, damn those tiny birds, that turned not to be enough in most of the situations. Next time I’m shooting condors ! 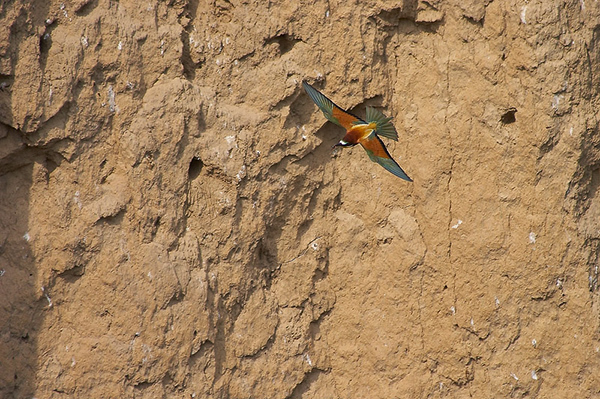 🙂 The bee eaters nested in two parallel sandy cliffs, probably formed by a flash flood or a past creek. The nests are burrowed in the soft banks, far from predators, though we saw a snake managed to get in, I assume lured by the eggs. The idea is to set up a tent on the rim of one of the banks and leave it there for a day or two for the birds to get used to. After that use it for a hiding shelter, hopefully getting a bird perched on a branch close enough for a good shot.